While were at it, I was thinking why not a superfractor? 1 of 1, baby! 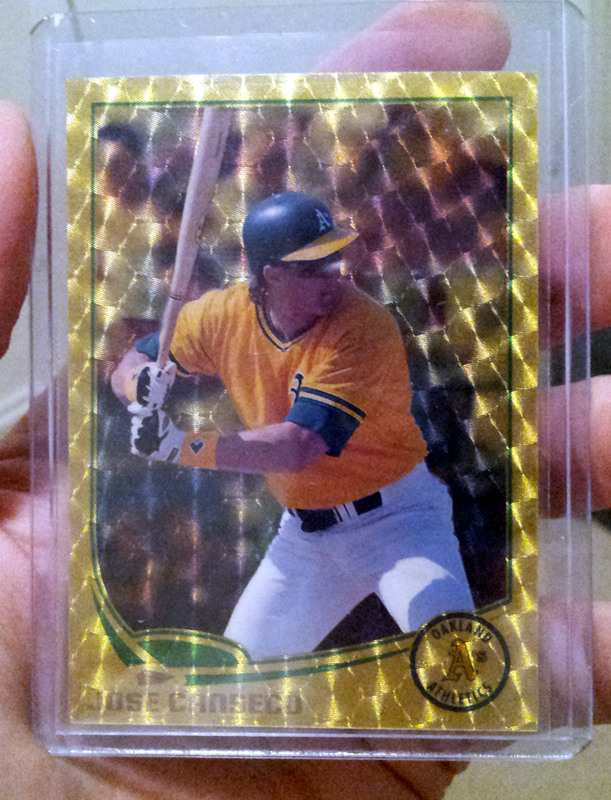 And what the heck, why not an actual custom INVISIFRACTOR – that’s right, folks. You saw it here first! If you don’t know what the invisfractor is, check out more here . It is fantastic stuff. 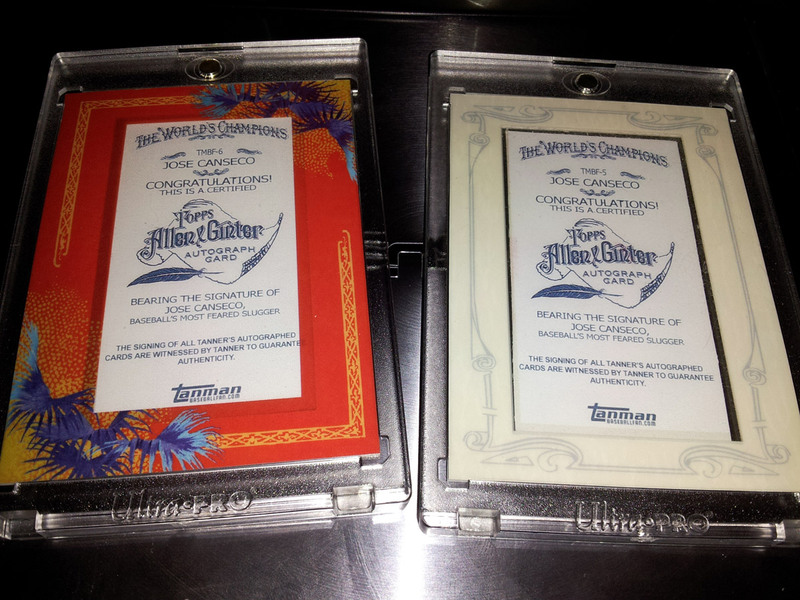 Sumrtop gave me a surprise by doing the psa holder – that was a great addition! If you look closely enough to these designs and know what to look for, you will see a blurred picture of me and Jose together in the background of each card. But way … there’s more! 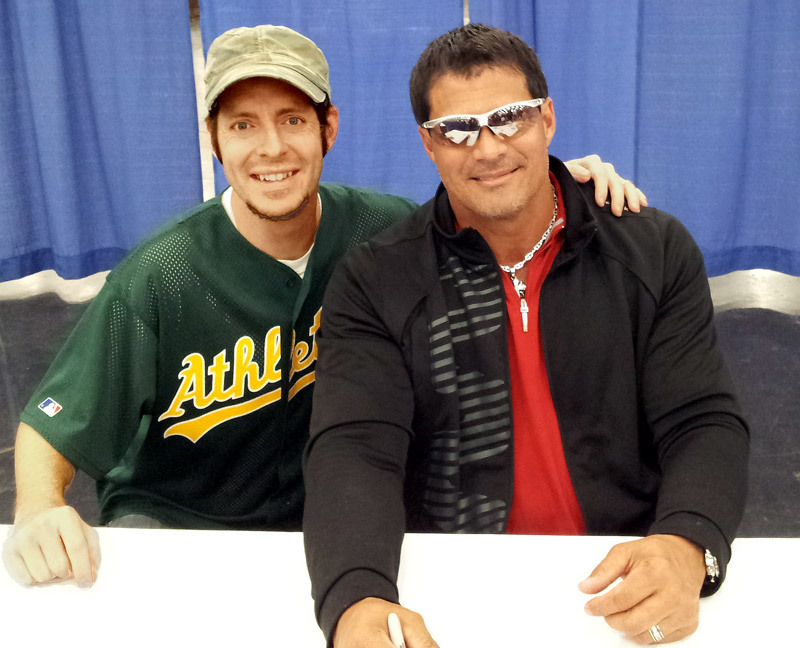 Shortly before this flurry of Canseco-ey goodness, I found out Jose was going to be in town to sign autographs. (YEAH!!!) 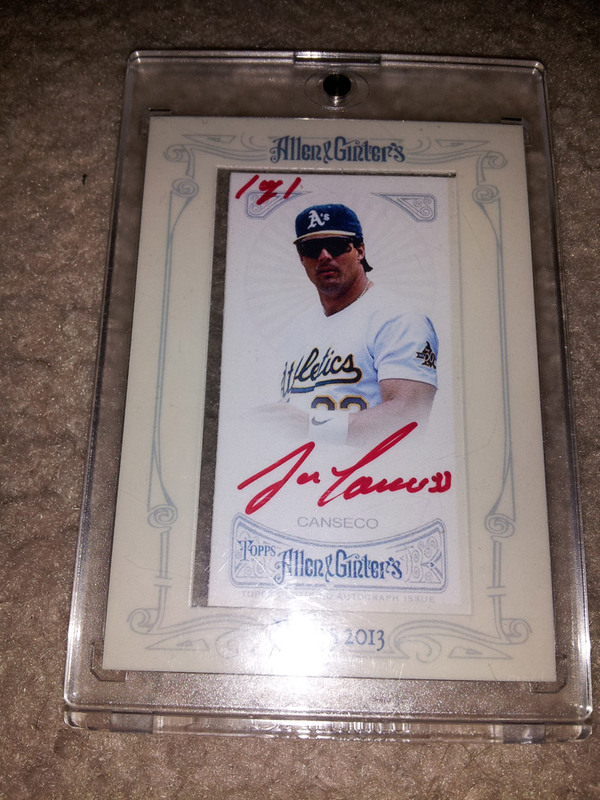 So I decided to design a card with an autograph window. Then another. Then another. Trying to forget what all this was going to cost and remember this is like the ultimate PC opportunity, I went all out. 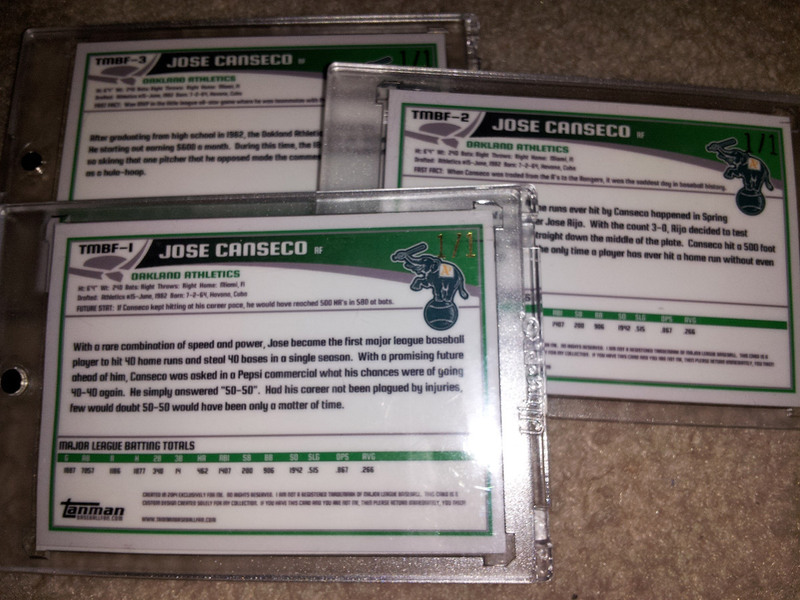 I designed the cards, had them put together and rushhhhed to me next day air. 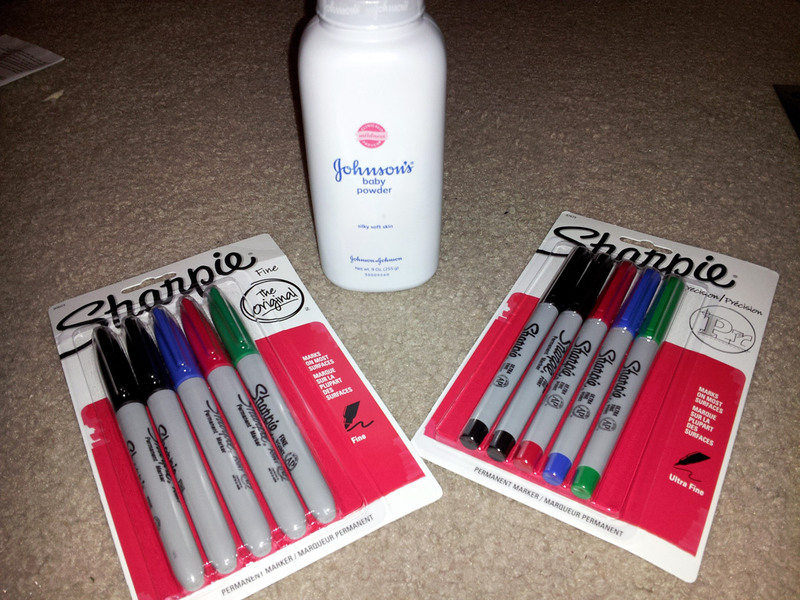 But wait … what if I get the wrong sharpie? What if it runs? What if it bubbles?? What if it smudges? NOOOOOOOO!!!!! 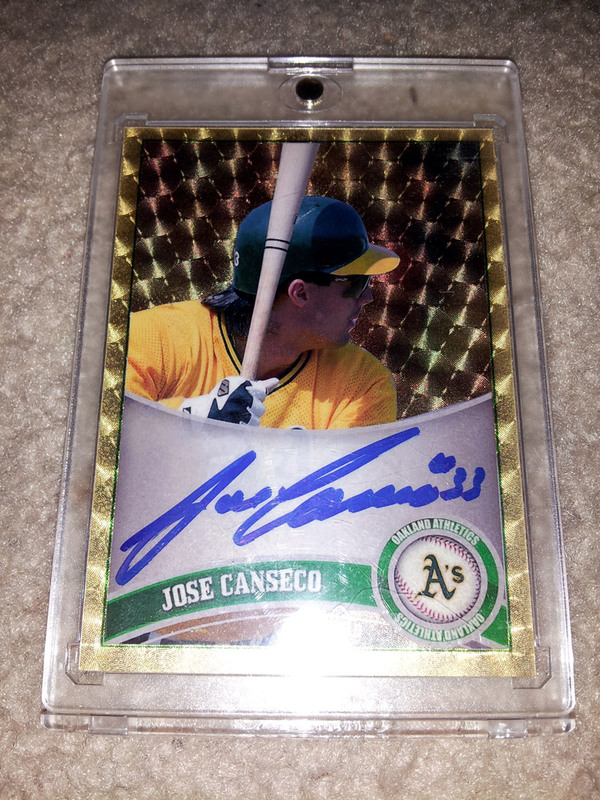 Baby powder to smudge on the top of the card for the auto to stick, and a few types of sharpies to practice with to see what I liked best. 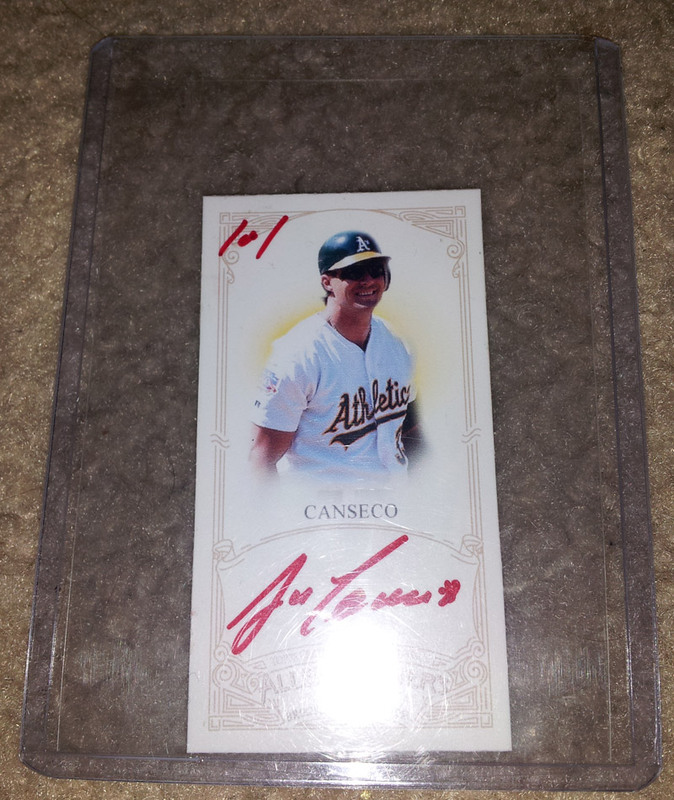 So, with all that taken care of, I went to bed last night, ready for the big Canseco meeting. But then I had an idea. 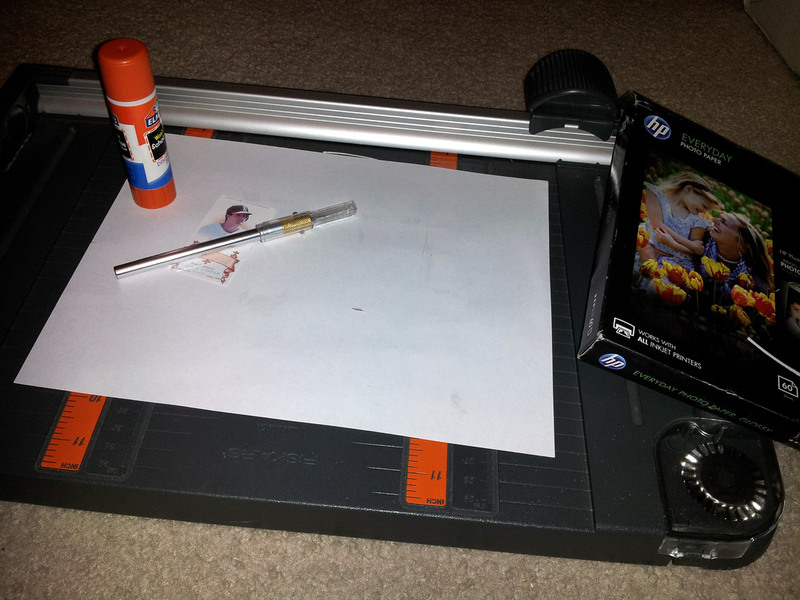 What if I could design and print out a custom Allen and Ginters in time for the show? WAIT … I’m doing 3 autographs already … why not 3 A&G’s??? 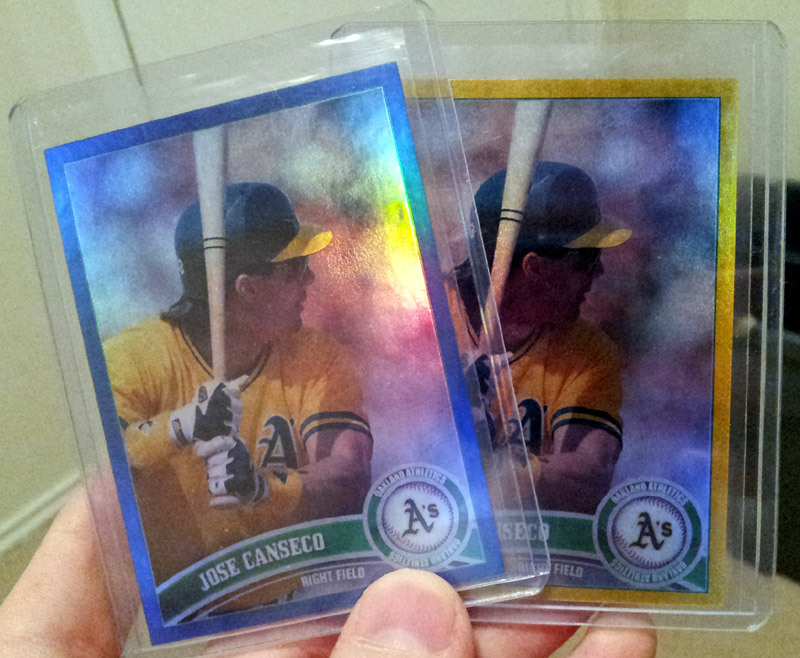 What if I could put them inside existing A&G autograph frame cards, after yanking out the non-Canseco auto that already exists??? So I got up out of bed, stayed up until 3 am last night, and that is just what I did. Then I got up at 7:30 and went back to work on them. 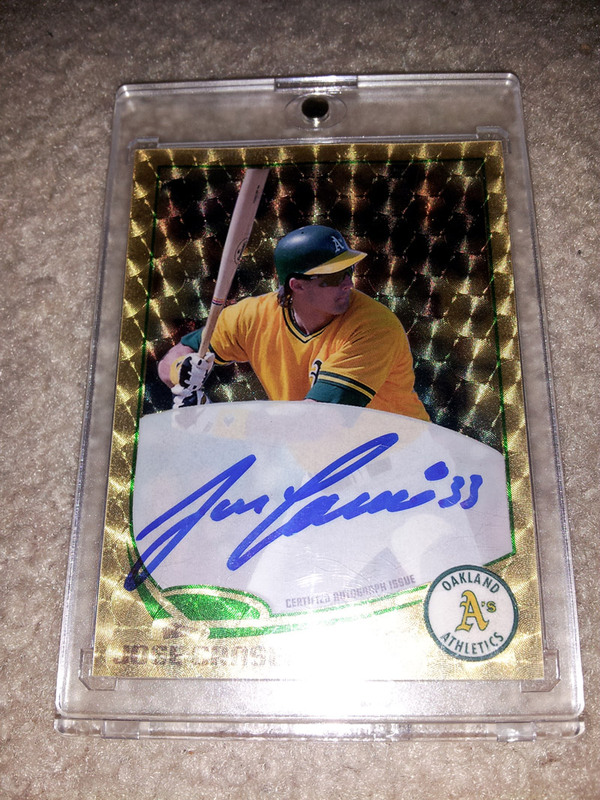 At a little after 12, I was in the car with my 6 custom cards ready to be signed. While I waited for Canseco to get there, I went to a few tables to pick up some one-touch magnetic holders (I have never bought these, because I generally never buy anything for my pc!) 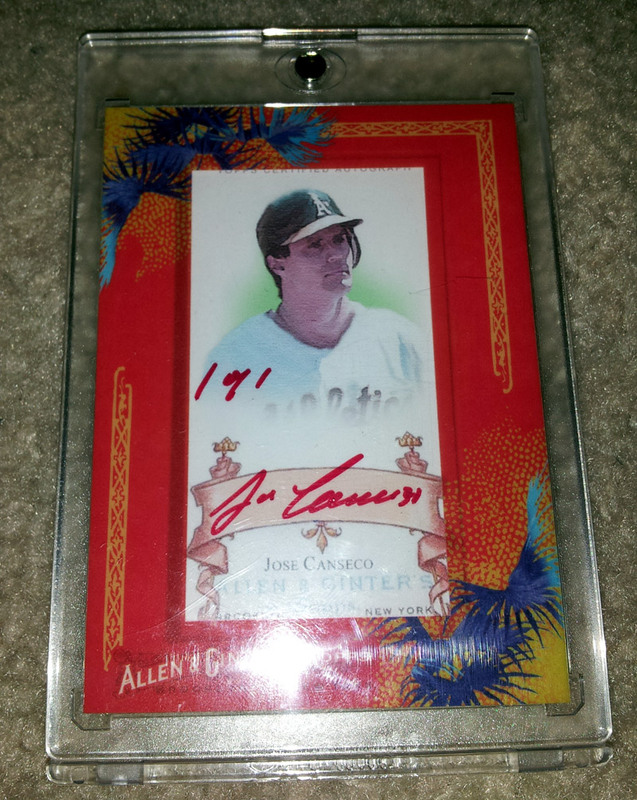 and some cheap-o A&G autos that I can pop out and put my customs in. I got in the line, and there he was! 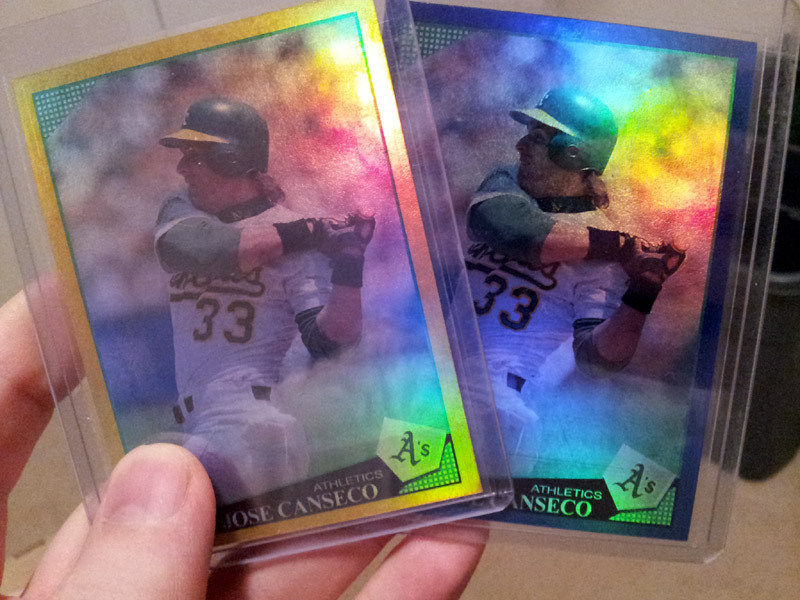 Mr. Canseco, in all of his muscle-ey glory. Finally, at the end, I mustered up enough courage to ask if I could have a picture with him, and he was fine with it, so a guy in the line volunteered to take my phone and take a few shots. So, with all that said – here is what all made it worth it .. I am so stoked about these new additions, not to mention the memories. I’ve gotten so many compliments on the superfractors and the A&G’s today, it has been wonderful. 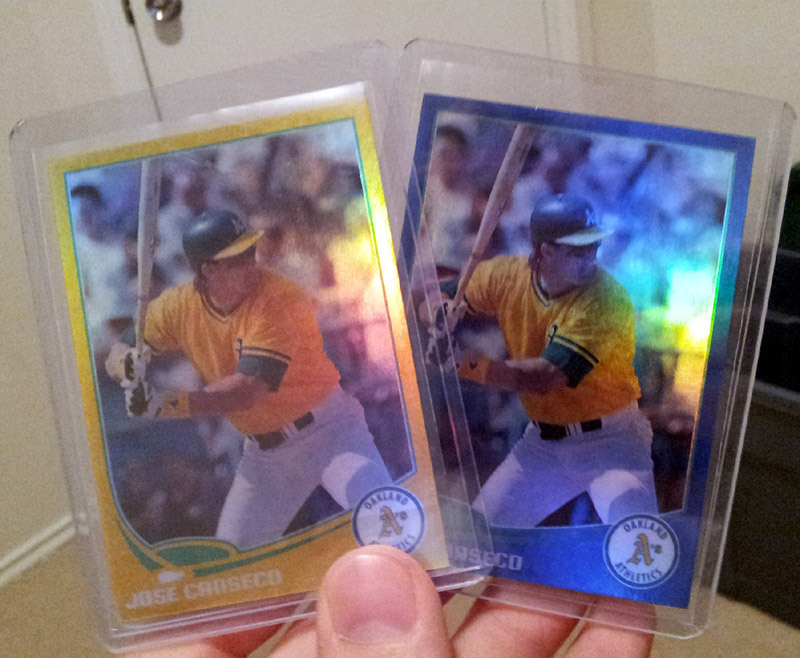 I’m not sure anything Canseco I pulled from a pack would stand up to these cards, but then again, anything I pull couldn’t be what I put together to my tastes, either. Finally, here is the pic at the end! 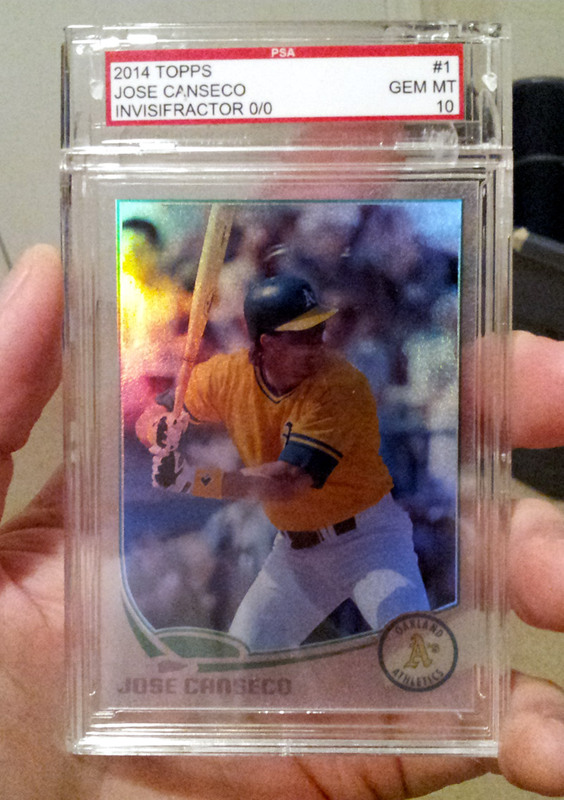 It is nice to have not just cards that I wished had been designed and put in the sets originally, but to know that I’m the only one with them, and they are autographed – and that Canseco gave me a compliment on them. Such a great day! 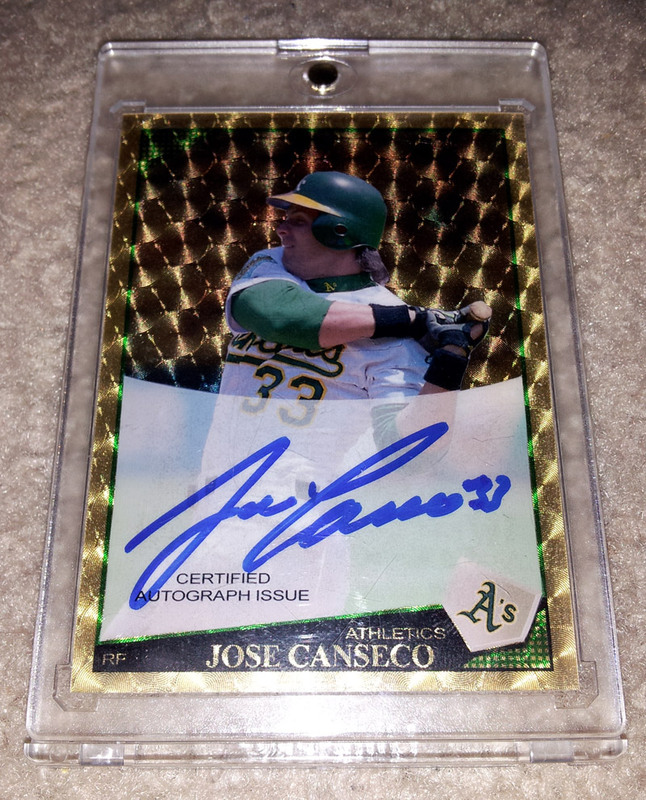 As an addendum, I just got an email saying that Jose Canseco responded to one of my tweets. Did you hear that? He responded to one of my tweets!!! Okay, I’m not sure exactly where this falls in line with greatest day ever for me, but sure is up there. Now, in an effort to stop like a giddy school girl, I’m going to go ahead and wrap up this blog posting. 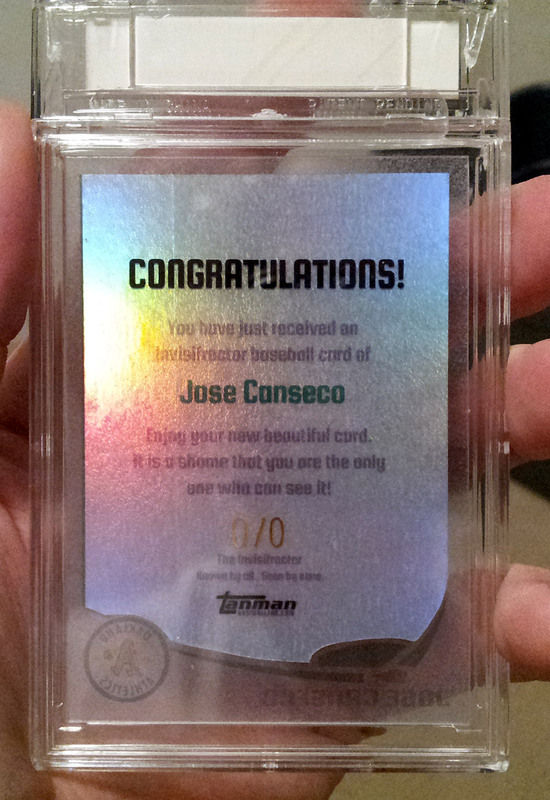 Simply awesome, great cards and a great experience, grats ! Those are some of the best customs I've ever seen… especially the Invisifractor and the two framed Ginters.